This is a volume of critical writings on film and video by theorists, critics and artists from the journal Undercut (1982-1990). 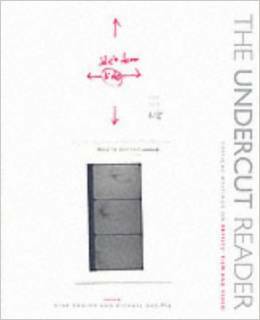 The Undercut Reader explores themes of film form, narative and representation, feminist perspectives, questions of identity, cultural and gay politics, experimental animation, landscape, imagination and aesthetics. It includes writings and visuals by and on, Stuart Hood, Noel Burch, Jayne Parker, Nina Danino, Sally Potter, Bill Viola, William Raban, John Akomfrah, Kobena Mercer, Mandy Merck, Peter Gidal, Malcom Le Grice, Peter Wollen, Andy Warhol, Peter Kennard, Mona Hatoum, Patrick Keiller, Christine Delphy. Jaqueline Rose, Jean Rouch, Stan Brackhage, Gayatri Spivak and Cerith Wyn Evans amongst others. The volume is prefaced by 5 commissioned essays, including 'The Intense Subject' Nina Danino, Chapter 1, Revisititations pp8-12 . This is a key note essay which introduces the volume through a critical appraisal of the debates on representation reflected in the Journal.